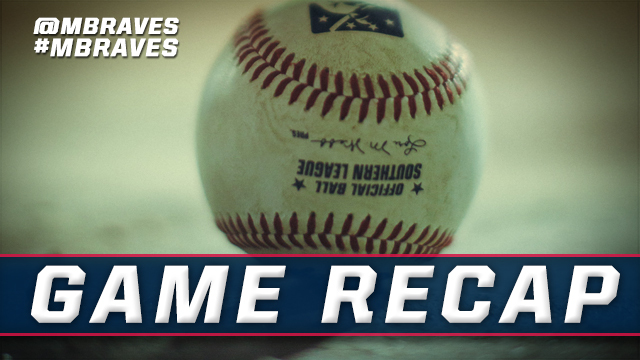 Jacksonville, FL - The Mississippi Braves tied team history with their eighth consecutive victory on Friday night, taking down the Jacksonville Suns 2-1 at the Baseball Grounds of Jacksonville. Jacob Schrader hit a go-ahead RBI double in the 9th inning to break a 1-1 tie, plating Dansby Swanson from third to give the Braves the win. It was their 21st win out of the last 26, and it put the Braves up six games in the South Division with Mobile's 7-5 loss to Montgomery. Michael Mader took a no-decision, throwing six shutout innings on seven hits and seven strikeouts in his Braves organization debut. Mississippi started the scoring in the 6th. Ozzie Albies singled and Dansby Swanson drove him in with a double against Suns starter Matt Tomshaw. Jacksonville tied it 1-1 against Braves reliever Tyler Lewis in the 7th. Sharif Othman led off the inning with a double, and Ronnie Mitchell drove him in with a two-out RBI single. AJ Minter (1-0) picked up the win in relief for the Braves, pitching a scoreless eighth with two strikeouts. Tayron Guerrero (0-1) took the loss, allowing the go-ahead double to Schrader in the 9th. Evan Phillips (S, 1), got his first save, striking out the side in the 9th. The Braves and Suns continue the series on Saturday night at 5:05 PM CT, with right-hander Max Povse (4-0, 2.65) taking the hill against Suns right-hander Patrick Johnson (6-7, 3.88).